I got a phone call yesterday from Greece to tell me that the great Shennai player from India, Ustad Bismillah Khan, had died of a heart attack. His health had been bad for a while and his playing had naturally reached it’s peak a few years ago. 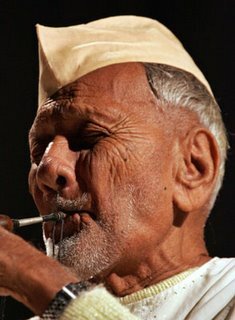 The gentle genius of Bismillah Khan is perhaps single handedly responsible for making Shehnai a famous classical instrument. Traditionally used to play music during marriages, Shehnai is the counterpart of south indian nadaswaram. It is also used to play music in temples. Born in a small Bihar village in 1917, Ustad Bismillah learned shehnai from his uncle who used to play in the famous Vishwanath temple of Varanasi. He brought Shehnai to the center stage of indian music with his concert in the calcutta All India Music Conference in 1937. There was no looking back. Ustad Bismillah Khan is the third classical musician after Pt Ravi Shankar and Smt M S Subbulakshmi to be awarded Bharath Rathna, the highest civilian honour in India. However even though he was well respected and used by the government as part of the Indian culture promo list he wasn’t really kept in the manner he should have been and he even threatened to hand the award back if he didn’t get a cheque….he got one eventually. Bismillah had the onus of feeding a hundred persons, ten sons included. He travelled across the world but didn’t like flying. In India he would mostly travel by train. Bismillah had a retinue of 8-10 accompanists – quite a large number. He would travel to the railway station by cycle rickshaw, heading a caravan of 4 or 5, waving to familiar passersby, no less happy than a prince in a Rolls Royce! He was very well loved by the people and his healthy perspective and example on the overlap of being both Muslim and Hindu was well noted by the people. I myself was touched by his playing and his rendition of Multani at the banks of the Ganges was what inspired the ElectroRaga Version of Multani recently in Manchester. You can hear me triggering and chopping his Shennai playing. And here is the original performance that I took it from as hosted on Patrick Moutal’s excellent website on Indian music. This news of his death didn’t make it to the UK newspapers or websites as far as I could see. Let us not forget this link with the old world of magic as handed to us in the form of Bismillah Khan. His kind are less every year. This gig like the rest wasn’t agreed…..thing is it wasn’t the authorities we were worried about it was the lawless…..this one was in the red light district of Manchester. Watch out for a cameo by Mick Jagger. Drongomala is set to release his first solo album Scale on Flying Mountain Records. Scale came to life in many locations including Southern India, a Greek island and the UK, before being mixed in the famous Hyde Street Studios in San Francisco – a life-cycle that gives the album a truly border and genre-busting feel. This exciting new release makes a break from the hyped dynamics of today’s records, taking a particularly strong lead from collaborative performances by some of the top Indian classical musicians in the southern Indian region of Kerala. All is finally unified by Drongomala’s powerful emotive voice and acoustic guitar. Opening with the fanfare of Rise and Fall the stage is set for the album’s themes of power, love, addiction and disconnection. ‘Be A Bird’ has a Nick Drake influenced mood of gentle introspection, ‘Money’ hosts a broken and bluesy feel reminiscent of early Beck records, ‘Poppy Flower’ phases in and out of focus like a drug dream surrounded by beautiful Santoor playing while ‘Out of Them All’ takes an 808 drum machine and flute for a ride through dreams of gold and the confusion of choices in life. The record is stuffed with jewels. Drongomala was born in Manchester,UK, to an Irish mother and Scottish father. He spent most of his childhood in broken mining towns in Scotland and on the border in Ireland. Playing in indie rock bands during his teens he led the Scottish band Baby Bartok to great heights before they spectacularly imploded after an appearance on a primetime weekend TV show hosted by the enimitable Jonathon Ross. After a period of recovery Drongomala went on to work in the drum and bass scene in Edingburgh with turntablists and musicians releasing through compilations and online communities, but soon the double time beats of jungle gave way to the percussive flurry of Indian tabla beats. 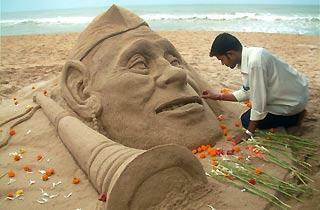 Scale is the record that captures Drongomala’s fascination with all things Indian. It is a unique love letter from India – a must for World music fans and a door into Indian music for those who find fusion to be too spicy for their taste.